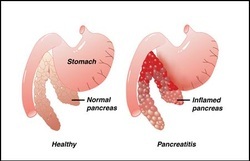 Pancreatitis can be divided into acute pancreatitis and chronic pancreatitis. Acute pancreatitis may present with symptoms and signs such as nausea, vomiting, epigastric and left upper quadrant abdominal pain which radiates to the back as well as fever. The condition is worsen with alcohol intake. Acute pancreatitis may occur due to hyperlipidemia, autoimmune disease, drugs such as sulfonamides or thiazides, hypercalcemia, alcohol and gallstones as well as mumps infection. Calcium soap deposition may occur with damage of the vascular system, necrosis of the parenchyma and inflammation as well as interstitial edema. The pancreas may appear hemorrhagic with fat necrosis. These are the pathological signs of acute pancreatitis. acute pancreatitis may occur as a result of auto digestion of the pancreatic organ from the activation of the pancreatic enzyme. Chronic pancreatitis may present with symptoms and signs such as diabetes, pancreatic insufficiency and recurrent bouts of back pain and pain in the abdomen. Chronic pancreatitis may occur due to repeated cases of acute pancreatitis, cystic fibrosis and alcoholism. Chronic pancreatitis may appear pathological with infiltration of inflammatory mononuclear ,calcified concretions, fibrous replacement, pseudocyst formation, lobular appearance of the pancreas due to the present of fibrous band and destruction of the acini with sparing of the islet of langerhans. Both acute and chronic pancreatitis may present with complication such as acute renal failure, fat necrosis, disseminated intravascular coagulation, tetany and acute respiratory distress syndrome. Acute and chronic pancreatitis may also characterized by elevation of serum amylase and lipase as well as leukocytosis. The treatment of pancreatitis may include IV fluids, food restriction, insulin replacement,pancreatic enzyme replacement and IV calcium gluconate. 1.G, Klöppel. “Pathology of Chronic Pancreatitis and Pancreatic Pain.” Acta Chirurgica Scandinavica 156, no. 4 (April 1990): 261–265. 2.Lankisch, Prof Dr P. G., and Peter A. Banks. “Acute Pancreatitis: Pathology.” In Pancreatitis, 65–69. Springer Berlin Heidelberg, 1998.